Perhaps the most available car in the Japanese used car auctions is the Toyota Prius. Due to it’s huge numbers, the prices can be totally predictable. Removing “black” Prius’ from the data (black colour doesn’t seem to behave in the same manner as the other colours), results for Prius sales in the last few months. The Prius targeted was the 2010 model. 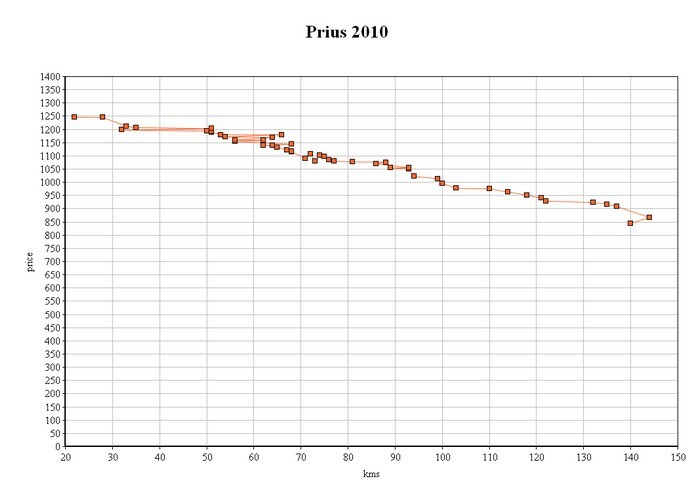 The price the car sold in the auctions was plotted against the kms of that vehicle. All vehicles were grade 4.